In Revelation 5, we saw that the sealed scroll the Lamb takes from the right hand of God is the "purchase deed" to the Earth. Jesus is the Kinsman Redeemer, being the only one worthy to open the sealed scroll and reclaim the Earth. Subsequent chapters in Revelation show that the contents within the "purchase deed" are judgments which must come to pass on Earth before the Lord returns. These judgments are to prepare for the Lord's earthly reign in two ways: To evict the rebellious inhabitants from the earth, and turn the Jewish people back to God. God has determined that twenty-one judgments will occur after Jesus takes the sealed scroll. The sealed "purchase deed" to the earth includes all twenty-one judgments, divided into three groups: Seals, Trumpets, and Bowls. The last Seal judgment includes the seven Trumpet judgments. The last Trumpet judgment includes the seven Bowl Judgments. "In the Hebrew, 7 is shevah. It is from the root savah, to be full or satisfied, have enough of. Hence the meaning of the word "seven" is dominated by this root, for on the seventh day God rested from the work of Creation. It was full and complete, and good and perfect. Nothing could be added to it or taken from it without marring it. Hence the word Shavath, to cease, desist, rest, and Shabbath, Sabbath, or day of rest...."
"Another meaning of the root Shavagh is to swear, or make an oath. It is clear from its first occurrence in Genesis 21:31, "They sware both of them," that this oath was based upon the "seven ewe lambs" (verses 28-30), which point to the idea of satisfaction or fullness in an oath. It was the security, satisfaction, and fullness of the obligation, or completeness of the bond, which caused the same word to be used for both the number seven and an oath; and hence it is written, "an oath for confirmation is an end of all strife." Beer-sheba, the well of the oath, is the standing witness of the spiritual perfection of the number 7." Leviticus 26:18, 21, 23-24, 27-28 - And after all this, if you do not obey Me, then I will punish you seven times more for your sins.... Then, if you walk contrary to Me, and are not willing to obey Me, I will bring on you seven times more plagues, according to your sins.... And if by these things you are not reformed by Me, but walk contrary to Me, then I also will walk contrary to you, and I will punish you yet seven times for your sins.... And after all this, if you do not obey Me, but walk contrary to Me, then I also will walk contrary to you in fury; and I, even I, will chastise you seven times for your sins. History has shown us that the 70 weeks are 70 "weeks" of years, or 490 years. There were 483 years from the command to Nehemiah to restore and build Jerusalem after Israel's exile until Jesus died, being "cut off" (Daniel 9:26). During those 483 years, God punished Israel under the yoke of Gentile rule. After the cross, God turned away from Israel because they rejected His Son (Romans 11). Seven more years are left of the 70 "weeks" of punishment. Today we live in the gap between the 483 years and the last seven years. During these last seven years, God will turn back to Israel. However, God will punish Israel along with His enemies through the judgments recorded in the "purchase deed" of the earth. "Two straight lines cannot possibly enclose any space, or form a plane figure; neither can two plan surfaces form a solid. Three lines are necessary to form a plane figure; and 3 dimensions of length, breadth, and height, are necessary to form a solid. Hence the number is the symbol of the cube -- the simplest form of solid figure. As two is the symbol of the square, or plane contents (x*x), so three is the symbol of the cube, or solid contents (x*x*x)." "Three, therefore, stands for that which is solid, real, substantial, complete, and entire. All things that are specially complete are stamped with this number...."
Lawlessness/Conquest Dominion by the lawless one begins. Peace taken from Earth Destruction of the earth begins by removal of peace and bloodshed, not by water. Global Famine & Inflation The land becomes cursed. Death One of the purposes of "Daniel's 70th Week" is to "finish the transgression," which is judgment for breaking the Law (Daniel 9:24). Vengeance on those who martyr the saints The Lord will destroy His enemies avenging the blood of His saints. Cosmic disturbances The world will acknowledge God. No judgments God will withhold His judgment for a "half hour." 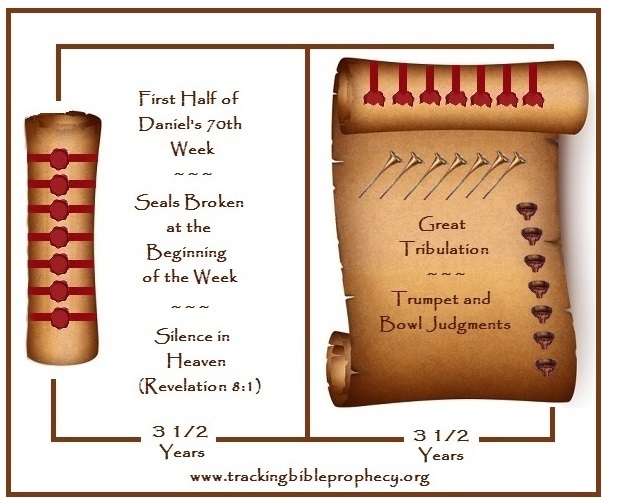 Just as these spiritual horses came with God's judgment against the nations during the first 483 years of "Daniel's 70 Weeks," we will see in the next few sections, they will come again with God's judgment against the nations during the final seven years. Hebrews 9:11-12, 15 - But Christ came as High Priest of the good things to come, with the greater and more perfect tabernacle not made with hands, that is, not of this creation. Not with the blood of goats and calves, but with His own blood He entered the Most Holy Place once for all, having obtained eternal redemption.... And for this reason He is the Mediator of the new covenant, by means of death, for the redemption of the transgressions under the first covenant, that those who are called may receive the promise of the eternal inheritance. It is important to note, the Lamb not only opens the first seal, but He opens ALL the seals. As we will see in Revelation 8, the last Seal includes the last fourteen judgments in Revelation. In other words, it is Christ who administers all twenty-one judgments. Revelation 6:1 - ...and I heard one of the four living creatures saying with a voice like thunder, "Come and see." Click here for commentary on the four living creatures. 1 Samuel 2:10 - The adversaries of the LORD shall be broken in pieces; from heaven He will thunder against them. The LORD will judge the ends of the earth. "He will give strength to His king, and exalt the horn of His anointed. Revelation 6:2 - And I looked, and behold, a white horse. The four living creatures announce the arrival of four horses in the first four seals. Each horse has a rider, but the attention is initially drawn to the horse. The horses' prominence over the horsemen should draw us to seek meaning in other Scripture to their significance. As shown in the introduction, these horses are found in the book of Zechariah and tied to God's judgment. Recall from Revelation 1:14, the color white usually represents purity and cleansing from sin (Isaiah 1:18, Psalms 51:5-7). However, in the context of this passage in Revelation, white symbolizes conquest. Incidentally, great military leaders like Alexander the Great, Napoleon and others are often found riding white horses in portraits. Revelation 19:11-15 - Now I saw heaven opened, and behold, a white horse. And He who sat on him was called Faithful and True, and in righteousness He judges and makes war. His eyes were like a flame of fire, and on His head were many crowns. He had a name written that no one knew except Himself. He was clothed with a robe dipped in blood, and His name is called The Word of God. And the armies in heaven, clothed in fine linen, white and clean, followed Him on white horses. Now out of His mouth goes a sharp sword, that with it He should strike the nations. And He Himself will rule them with a rod of iron. He Himself treads the winepress of the fierceness and wrath of Almighty God. Revelation 6:2 - He who sat on it had a bow; and a crown was given to him, and he went out conquering and to conquer. 1 Chronicles 5:18 - The sons of Reuben, the Gadites, and half the tribe of Manasseh had forty-four thousand seven hundred and sixty valiant men, men able to bear shield and sword, to shoot with the bow, and skillful in war, who went to war. Isaiah 21:15 - For they fled from the swords, from the drawn sword, from the bent bow, and from the distress of war. Jeremiah 6:23 - They will lay hold on bow and spear; they are cruel and have no mercy; their voice roars like the sea; and they ride on horses, as men of war set in array against you, O daughter of Zion. 2 Samuel 22:35 - He teaches my hands to make war, so that my arms can bend a bow of bronze. Psalms 7:11-12 - God is a just judge, and God is angry with the wicked every day. If he does not turn back, He will sharpen His sword; He bends His bow and makes it ready. Jeremiah 50:14-15 - "Put yourselves in array against Babylon all around, all you who bend the bow; shoot at her, spare no arrows, for she has sinned against the LORD. Shout against her all around; she has given her hand, her foundations have fallen, her walls are thrown down; for it is the vengeance of the LORD. Take vengeance on her. As she has done, so do to her." Lamentations 2:4 - Standing like an enemy, He has bent His bow; with His right hand, like an adversary, He has slain all who were pleasing to His eye; on the tent of the daughter of Zion, He has poured out His fury like fire. Zechariah 9:13 - For I have bent Judah, My bow, fitted the bow with Ephraim, and raised up your sons, O Zion, against your sons, O Greece, and made you like the sword of a mighty man. Daniel 11:39-44 - Thus he shall act against the strongest fortresses with a foreign god, which he shall acknowledge, and advance its glory; and he shall cause them to rule over many, and divide the land for gain. "At the time of the end the king of the South shall attack him; and the king of the North shall come against him like a whirlwind, with chariots, horsemen, and with many ships; and he shall enter the countries, overwhelm them, and pass through. He shall also enter the Glorious Land, and many countries shall be overthrown; but these shall escape from his hand: Edom, Moab, and the prominent people of Ammon. He shall stretch out his hand against the countries, and the land of Egypt shall not escape. He shall have power over the treasures of gold and silver, and over all the precious things of Egypt; also the Libyans and Ethiopians shall follow at his heels. But news from the east and the north shall trouble him; therefore he shall go out with great fury to destroy and annihilate many. Daniel 8:24 - His power shall be mighty, but not by his own power; he shall destroy fearfully, and shall prosper and thrive; he shall destroy the mighty, and also the holy people. Through his cunning he shall cause deceit to prosper under his rule; and he shall exalt himself in his heart. He shall destroy many in their prosperity. He shall even rise against the Prince of princes; but he shall be broken without human means. 2 Samuel 1:22 - From the blood of the slain, from the fat of the mighty, the bow of Jonathan did not turn back, and the sword of Saul did not return empty. 1 Kings 22:34 - Now a certain man drew a bow at random, and struck the king of Israel between the joints of his armor. So he said to the driver of his chariot, "Turn around and take me out of the battle, for I am wounded." 2 Chronicles 17:17 - Of Benjamin: Eliada a mighty man of valor, and with him two hundred thousand men armed with bow and shield. Daniel 11:21-24 - And in his place shall arise a vile person, to whom they will not give the honor of royalty; but he shall come in peaceably, and seize the kingdom by intrigue. With the force of a flood they shall be swept away from before him and be broken, and also the prince of the covenant. And after the league is made with him he shall act deceitfully, for he shall come up and become strong with a small number of people. He shall enter peaceably, even into the richest places of the province; and he shall do what his fathers have not done, nor his forefathers: he shall disperse among them the plunder, spoil, and riches; and he shall devise his plans against the strongholds, but only for a time. Ezekiel 34:25, 27-28 - I will make a covenant of peace with them.... They shall be safe in their land; and they shall know that I am the LORD, when I have broken the bands of their yoke and delivered them from the hand of those who enslaved them. And they shall no longer be a prey for the nations, nor shall beasts of the land devour them; but they shall dwell safely, and no one shall make them afraid. 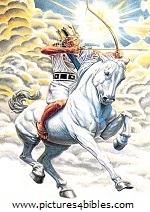 The rider of the white horse is not the antichrist himself, as he is a man (2 Thessalonians 2:3). Rather, the evidence suggests that the rider is the spirit of lawlessness. There are at least two archers in Scripture who were antichrist types, which support this notion. The first archer in the Bible was Ishmael (Genesis 21:21). Another famous archer was Esau (Genesis 27:1-4). As shown in the study: "Nationality of the Antichrist," the spirit of lawlessness has manifest in the offspring of Ishmael and Esau. The antichrist may even be offspring from this same cursed line. Whether or not this is the case, the antichrist will certainly be operating in the spirit of lawlessness. 1 John 4:2-3 - By this you know the Spirit of God: Every spirit that confesses that Jesus Christ has come in the flesh is of God, and every spirit that does not confess that Jesus Christ has come in the flesh is not of God. And this is the spirit of the Antichrist, which you have heard was coming, and is now already in the world. The man who will be the antichrist will work in both the spirit of antichrist, denying Christ, and the spirit of lawlessness, set out to conquer by any means. The rider on the first white horse wears a crown. The crown of the first rider is a "stephanos." As discussed in the "Pre-Tribulation Rapture" study, the "stephanos" is the victor's crown. In the ancient Olympics, judges awarded ivy crowns or wreaths, called "stephanos," to the winners of the various events at the "Bema." They still do this at the Olympics and other athletic events today, using medals instead of crowns. This crown is different from the crowns the Lord Jesus Christ wears when He returns on the last white horse in Revelation. The Lord has "diadems," or crowns of royalty on His head when He returns to Earth (Revelation 19:12). That being said, the Lord does wear the "stephanos" in Revelation 14:14, when He harvests the last of the souls of the Tribulation Saints to Heaven, before He returns. Wearing the "stephanos" in this instance shows the Lord's victory in winning souls, in the midst of the trials of the Tribulation. Revelation 19:12, 16 - ...on His head were many crowns. He had a name written that no one knew except Himself.... And He has on His robe and on His thigh a name written: KING OF KINGS AND LORD OF LORDS. Daniel 8:23-25 - "And in the latter time of their kingdom, when the transgressors have reached their fullness, a king shall arise, having fierce features, who understands sinister schemes. His power shall be mighty, but not by his own power; he shall destroy fearfully, and shall prosper and thrive; he shall destroy the mighty, and also the holy people. "Through his cunning he shall cause deceit to prosper under his rule; and he shall exalt himself in his heart. He shall destroy many in their prosperity. He shall even rise against the Prince of princes; but he shall be broken without human means."" 2 Thessalonians 2:7-9 - For the mystery of lawlessness is already at work; only He who now restrains will do so until He is taken out of the way. And then the lawless one will be revealed, whom the Lord will consume with the breath of His mouth and destroy with the brightness of His coming. The coming of the lawless one is according to the working of Satan, with all power, signs, and lying wonders. In short, the white horse rides out in judgment when the Lamb of God breaks the first seal on the "purchase deed" to the earth. The rider on the white horse has characteristics of the antichrist, but other scriptures show that the horses and their riders sent out by God are spirit beings. Therefore, the first white horse and his rider represent the spirit of lawlessness, who operates through the antichrist in victorious conquest, first by diplomacy, and later by military force. Revelation 6:3 - When He opened the second seal, I heard the second living creature saying, "Come and see." Revelation 6:4 - Another horse, fiery red, went out. Isaiah 63:2-3 - Wherefore art thou red in thine apparel, and thy garments like him that treadeth in the winefat? I have trodden the winepress alone; and of the people there was none with me: for I will tread them in mine anger, and trample them in my fury; and their blood shall be sprinkled upon my garments, and I will stain all my raiment. 2 Kings 3:22-24 - Then they rose up early in the morning, and the sun was shining on the water; and the Moabites saw the water on the other side as red as blood. And they said, "This is blood; the kings have surely struck swords and have killed one another; now therefore, Moab, to the spoil!" So when they came to the camp of Israel, Israel rose up and attacked the Moabites, so that they fled before them; and they entered their land, killing the Moabites. Revelation 6:4 - And it was granted to the one who sat on it to take peace from the earth, and that people should kill one another; and there was given to him a great sword. The red horse comes to take peace from the earth, thus, red signifies bloodshed in this context. The rider of the first horse brings a false peace, which later ends in conquest. Daniel 9:27 and Isaiah 28:15-22 show this false peace, or "covenant with death," will last through the first half of "Daniel's 70th Week." Therefore, the peace covenant confirmed between Israel and the antichrist is different from the peace that the rider of the red horse takes from the earth, as Jesus breaks this seal near the beginning of "Daniel's 70th Week," but the "covenant with death" continues to the middle of the Tribulation. Peace being taken from the earth shows the global nature of this judgment. Some believe many of the Seal judgments have already been broken, being the birth pangs described in Matthew 24, which lead up to the Tribulation period. The fact that the world hasn't dissolved into anarchy, as described here in Revelation, is evidence that the second seal has not been broken yet. 2 Chronicles 20:14-15, 22-24 - Then the Spirit of the LORD came upon Jahaziel the son of Zechariah, the son of Benaiah, the son of Jeiel, the son of Mattaniah, a Levite of the sons of Asaph, in the midst of the assembly. And he said, "Listen, all you of Judah and you inhabitants of Jerusalem, and you, King Jehoshaphat! Thus says the LORD to you: 'Do not be afraid nor dismayed because of this great multitude, for the battle is not yours, but God's....'" Now when they began to sing and to praise, the LORD set ambushes against the people of Ammon, Moab, and Mount Seir, who had come against Judah; and they were defeated. For the people of Ammon and Moab stood up against the inhabitants of Mount Seir to utterly kill and destroy them. And when they had made an end of the inhabitants of Seir, they helped to destroy one another. So when Judah came to a place overlooking the wilderness, they looked toward the multitude; and there were their dead bodies, fallen on the earth. No one had escaped. 1 Samuel 14:12, 20, 23 - Then the men of the garrison called to Jonathan and his armorbearer, and said, "Come up to us, and we will show you something." Jonathan said to his armorbearer, "Come up after me, for the LORD has delivered them into the hand of Israel." ...Then Saul and all the people who were with him assembled, and they went to the battle; and indeed every man's sword was against his neighbor, and there was very great confusion.... So the LORD saved Israel that day, and the battle shifted to Beth Aven. Judges 7:20-22 - Then the three companies blew the trumpets and broke the pitchers - they held the torches in their left hands and the trumpets in their right hands for blowing - and they cried, "The sword of the LORD and of Gideon!" And every man stood in his place all around the camp; and the whole army ran and cried out and fled. When the three hundred blew the trumpets, the LORD set every man's sword against his companion throughout the whole camp; and the army fled to Beth Acacia, toward Zererah, as far as the border of Abel Meholah, by Tabbath. Ezekiel 38:21 - "I will call for a sword against Gog throughout all My mountains," says the Lord GOD. "Every man's sword will be against his brother." Later, we will see that more parallels to the "Gog and Magog War" are found in other Seal judgments, which suggest this war is part of the opening act of the Tribulation period, or "Daniel's 70th Week." Absolute peace on Earth has been elusive. Until Jesus returns at the end of the Tribulation, true peace will not come. However, the significance in Christ breaking the second seal, is that any semblance of peace that was on the earth will end, resulting in anarchy and unrestrained violence. Revelation 6:5 - When He opened the third seal, I heard the third living creature say, "Come and see." So I looked, and behold, a black horse, and he who sat on it had a pair of scales in his hand. Jeremiah 4:27-28 - For thus says the LORD: "The whole land shall be desolate; yet I will not make a full end. For this shall the earth mourn, and the heavens above be black, because I have spoken. I have purposed and will not relent, nor will I turn back from it." Lamentations 4:8 - Now their appearance is blacker than soot; they go unrecognized in the streets; their skin clings to their bones, it has become as dry as wood. Those slain by the sword are better off than those who die of hunger; for these pine away, stricken for lack of the fruits of the field. A "pair of scales" is a device with two scales hung and balanced on a center beam. Pre-measured stones act as counter weights to measure items such as food or currency. The next verse shows the context of the black horse is indeed desolation and famine. Revelation 6:6 - And I heard a voice in the midst of the four living creatures saying, "A quart of wheat for a denarius, and three quarts of barley for a denarius..."
Matthew 20:2 - Now when he had agreed with the laborers for a denarius a day, he sent them into his vineyard. A quart of wheat or barley is enough to feed one person for a day. After Jesus breaks the third seal, a person working might make enough wages to eat, but not enough to cover any other necessities of life, let alone feed more than a few family members, that is if they buy barley instead of wheat. Therefore, the picture painted here is of famine, which causes rampant inflation. Incidentally, inflation and famine usually follow war. Therefore, it is no surprise that after peace is taken from the earth (Revelation 6:4) both famine and inflation become a global issue. Ezekiel 4:16-17 - Moreover He said to me, "Son of man, surely I will cut off the supply of bread in Jerusalem; they shall eat bread by weight and with anxiety, and shall drink water by measure and with dread, that they may lack bread and water, and be dismayed with one another, and waste away because of their iniquity." Leviticus 26:26 - When I have cut off your supply of bread, ten women shall bake your bread in one oven, and they shall bring back your bread by weight, and you shall eat and not be satisfied. Revelation 6:6 - "...and do not harm the oil and the wine." Deuteronomy 7:13 - And He will love you and bless you and multiply you; He will also bless the fruit of your womb and the fruit of your land, your grain and your new wine and your oil, the increase of your cattle and the offspring of your flock, in the land of which He swore to your fathers to give you. 2 Chronicles 2:15 - Now therefore, the wheat, the barley, the oil, and the wine which my lord has spoken of, let him send to his servants. 2 Chronicles 31:5 - As soon as the commandment was circulated, the children of Israel brought in abundance the firstfruits of grain and wine, oil and honey, and of all the produce of the field; and they brought in abundantly the tithe of everything. Nehemiah 5:11 - Restore now to them, even this day, their lands, their vineyards, their olive groves, and their houses, also a hundredth of the money and the grain, the new wine and the oil, that you have charged them. Genesis 47:13-17 - Now there was no bread in all the land; for the famine was very severe, so that the land of Egypt and the land of Canaan languished because of the famine. And Joseph gathered up all the money that was found in the land of Egypt and in the land of Canaan, for the grain which they bought; and Joseph brought the money into Pharaoh's house. So when the money failed in the land of Egypt and in the land of Canaan, all the Egyptians came to Joseph and said, "Give us bread, for why should we die in your presence? For the money has failed." Then Joseph said, "Give your livestock, and I will give you bread for your livestock, if the money is gone." So they brought their livestock to Joseph, and Joseph gave them bread in exchange for the horses, the flocks, the cattle of the herds, and for the donkeys. Thus he fed them with bread in exchange for all their livestock that year. Genesis 47:18-22 - When that year had ended, they came to him the next year and said to him, "We will not hide from my lord that our money is gone; my lord also has our herds of livestock. There is nothing left in the sight of my lord but our bodies and our lands. Why should we die before your eyes, both we and our land? Buy us and our land for bread, and we and our land will be servants of Pharaoh; give us seed, that we may live and not die, that the land may not be desolate." Then Joseph bought all the land of Egypt for Pharaoh; for every man of the Egyptians sold his field, because the famine was severe upon them. So the land became Pharaoh's. And as for the people, he moved them into the cities, from one end of the borders of Egypt to the other end. Only the land of the priests he did not buy; for the priests had rations allotted to them by Pharaoh, and they ate their rations which Pharaoh gave them; therefore they did not sell their lands. Genesis 47:23-25 - Then Joseph said to the people, "Indeed I have bought you and your land this day for Pharaoh. Look, here is seed for you, and you shall sow the land. And it shall come to pass in the harvest that you shall give one-fifth to Pharaoh. Four-fifths shall be your own, as seed for the field and for your food, for those of your households and as food for your little ones." So they said, "You have saved our lives; let us find favor in the sight of my lord, and we will be Pharaoh's servants." Revelation 18:10-13 - '...Alas, alas, that great city Babylon, that mighty city! For in one hour your judgment has come.' "And the merchants of the earth will weep and mourn over her, for no one buys their merchandise anymore: merchandise of gold and silver, precious stones and pearls, fine linen and purple, silk and scarlet, every kind of citron wood, every kind of object of ivory, every kind of object of most precious wood, bronze, iron, and marble; and cinnamon and incense, fragrant oil and frankincense, wine and oil, fine flour and wheat, cattle and sheep, horses and chariots, and bodies and souls of men." Haggai 1:10-11 - Therefore the heavens above you withhold the dew, and the earth withholds its fruit. For I called for a drought on the land and the mountains, on the grain and the new wine and the oil, on whatever the ground brings forth, on men and livestock, and on all the labor of your hands. I favor a literal interpretation foremost, so I believe the famine will not become severe enough to harm olive trees and grape vines, unlike the famine in Haggai's day. That being said, history has proven over and over that the rich prosper in difficult times. The city Babylon, being full of luxury in the midst of a world in devastation, supports the figurative view that the rich will coast through unaffected by the inflation brought on by the famine that ensues, when the black horse rides out. In other words, this prophecy may have both literal and symbolic fulfillment. Revelation 6:7 - When He opened the fourth seal, I heard the voice of the fourth living creature saying, "Come and see." The fourth living creature beckons John come and see what judgment the Lord is sending on the earth with the breaking of the fourth seal. Revelation 6:8 - So I looked, and behold, a pale horse. 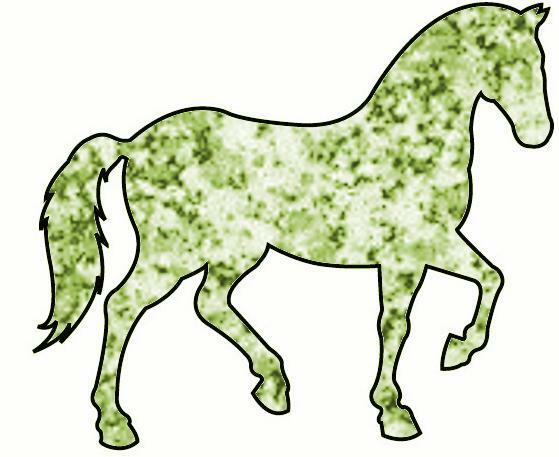 John describes the last horse as "chloros," which is the Greek word for green. The same word is found in Mark 6:39, Revelation 8:7, and Revelation 9:4, to describe the color of grass and plants. The color green has a large spectrum. A horse the color of green grass doesn't seem to fit the context of this horse being connected with death, as shown in the next section, which is probably why most translators call it a "pale" horse, being a greenish-yellow color. Revelation 6:8 - And the name of him who sat on it was Death, and Hades followed with him. The rider on the pale horse is given the name "Death." 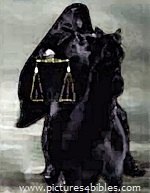 This rider is often pictured as the "Grim Reaper," a skeleton figure cloaked in black, carrying a large sickle. The "Grim Reaper" is prevalent in pop culture, having origins in mythology and paganism. 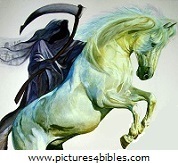 Even so, "Death" appears as a real entity, as John describes him as the rider on the pale horse and Zechariah describes the riders of the horses as "spirits of Heaven" (Zechariah 6:5). Acts 2:31 - ...concerning the resurrection of the Christ, that His soul was not left in Hades, nor did His flesh see corruption. Revelation 20:13-14 - The sea gave up the dead who were in it, and Death and Hades delivered up the dead who were in them. And they were judged, each one according to his works. Then Death and Hades were cast into the lake of fire. This is the second death. Revelation 6:8 - And power was given to them over a fourth of the earth, to kill with sword, with hunger, with death, and by the beasts of the earth. Click here for more on the four severe judgments of God. Notice that the rider on the pale horse is given the same power as the riders on the red and black horses; the power to kill people by sword and famine. The variegated color of this horse may visibly show this manifold judgment of God, which includes some of the judgments of the solid colored horses. In other words, the solid colored horses only bear one type of judgment, but the variegated colored horse delivers multiples types of judgment. These judgments will exacerbate those same judgments brought by the previous horses to a fourth of the earth. 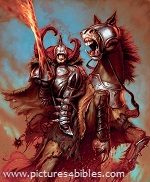 While the destruction on Gog's army is first by fire, the fourth horse will ride out bringing more destruction by sword, hunger, pestilence, and beasts. As shown in Zechariah 6:6-7, these four severe judgments of God naturally follow war. War causes scarcity of resources and breeds pestilence. When natural resources dwindle, wild beasts begin to attack humans for food. 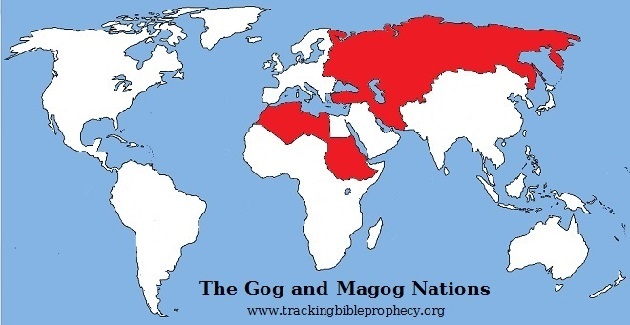 The "Gog and Magog War" will be no different, but on a larger scale than ever before seen on Earth. Click here for more parallels of the Seal judgments to the "Gog and Magog War." Job 5:17-22 - "Behold, happy is the man whom God corrects; therefore do not despise the chastening of the Almighty. For He bruises, but He binds up; He wounds, but His hands make whole. He shall deliver you in six troubles, yes, in seven no evil shall touch you. In famine He shall redeem you from death, and in war from the power of the sword. You shall be hidden from the scourge of the tongue, and you shall not be afraid of destruction when it comes. You shall laugh at destruction and famine, and you shall not be afraid of the beasts of the earth." Job's friends were wrong about a lot of things. Here Eliphaz confused chastisement with God's judgment and wrath. However, a believer in the Tribulation period could find comfort in this passage. 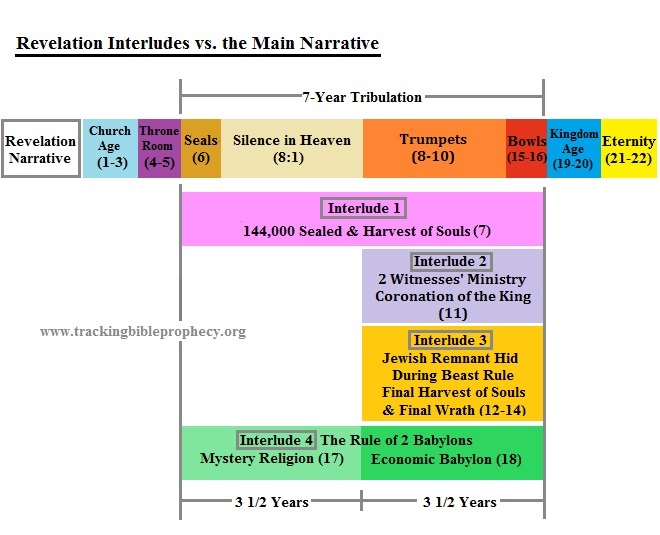 I find the mention of seven "troubles" interesting, in light of the seven years of Tribulation, in addition to the four severe judgments listed here that occur at the breaking of the fourth of seven seals. No matter what physically happens to the Tribulation Saints, God will restore them (Revelation 7:13-17, Revelation 20:4). The antichrist is the tool God uses to divide the children of light from the children of darkness (John 8:12) in the Tribulation period. Global war will cause chaos and division among the "waters," or Gentile nations (Revelation 17:15), which will allow the antichrist to form his global government. Famine occurs due to reduced availability of plants for food. The animals eaten as food also depend on the grain of the land to thrive. All life is dependent on the sun and the seasons. Let's recap. Jesus, the Creator, has opened the first four seals of the "purchase deed" to the earth. The four living creatures, which bear the likeness of the creatures on the earth and the tribal camps of Israel, announce the first four judgments on the earth. The four horses have parallels back to the first four days of creation. 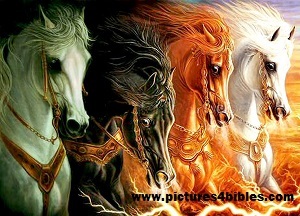 Christ Himself has parallels back to the four living creatures, with antitypes to the four horses. In other words, the number "four" represents the Creator and Creation in Scripture. It is no surprise that we find the number "four" replete in the "purchase deed" of the earth, which is really a deed to the creation. As we will see, a shift in focus of judgment on the earth in the first four seals extends to the spiritual realm in the last three seals. Incidentally, the number three means complete, or divine, as shown in the study: "Prophetic Pattern in Numbers," which fits the focus of the last three Seal judgments.